What’s the Controversy? Is Standing Better or Worse for Me Than Sitting at Work? Maybe you heard it from a colleague. Or on the drive to work over talk radio. Or maybe you had the idea put in your head by a clickbait-y headline (that you didn’t have the time to click on and investigate thoroughly). And if you’ve not caught wind well, there’s a nasty rumor going around that standing desks are worse for you than sitting. More specifically: that their use puts you at greater risk for heart disease than sitting does. At the root of this rumor (which isn’t true, by the way) is an oversimplification of new research on the link between standing at work and heart disease. Much of the online commentary surrounding this research, following its release, has perpetuated big misconceptions regarding our shared concern as computer workers: is sitting or standing better for our health? And, spoiler alert: a good mix of both is what’s doctor recommended — literally. By Dr. Peter Smith, Senior Scientist with the IWH who led the latest study on the matter. Dr. Smith heralds movement, above all else, as the cure for the weird maladies of modern work. So much so that he took straight to the web following the release of his latest study with a full article detailing and clarifying misconceptions he spotted across media coverage that he felt mostly missed the point of his team’s most recent work. Following are the most important points worth noting, for anyone both concerned for their health and, in some measure, tethered to their desk. Or whether standing desks are a good idea. Because Dr. Smith’s latest study wasn’t about office workers nor was it about standing desks. The study focused exclusively on people with jobs that require them to stand for 5+ hours at a time (retail employees, assembly line workers, bank tellers, hotel front-desk clerks…). It looked at jobs that don’t allow the privilege of sitting when tired. To apply his conclusion to office work where the option to sit exists is what you’d call a “bad extrapolation” of data or, in simpler terms, an apples and oranges kind of comparison. You might have heard about this study and thought, shoot, I’ll take safely back to the chair, then. But again, a critical point should be noted: nothing in Dr. Smith’s findings refutes prior research on the negative health effects of a sedentary lifestyle — i.e. sitting on our bums too much over the course of the day (beyond our time at work). Regardless of our job, we should all continue to fight the inertia of modern life by keeping active outside of work — and giving our hearts the proper workout that wards off the risk of heart disease. The pains of standing for hours at a time are very real; anyone who has worked on their feet their whole life is a testament to this. For those with an appetite for more science on it, check out the U.S. National Institute for Occupational Safety and Health’s 2015 literature review, which cites plenty of evidence of the serious risks of standing for too long (including low-back pain, leg pain, varicose veins, and chronic venous insufficiency). Or this fact sheet from the Canadian Centre for Occupational Health and Safety (CCOHS). Because they are part of the solution. The solution, that is, to the problem of heart disease. Jobs that involve a mix of standing, sitting and walking are linked with a 40% reduced risk of heart disease as compared to jobs that involve only sitting. In layman’s terms, movement stills wins. 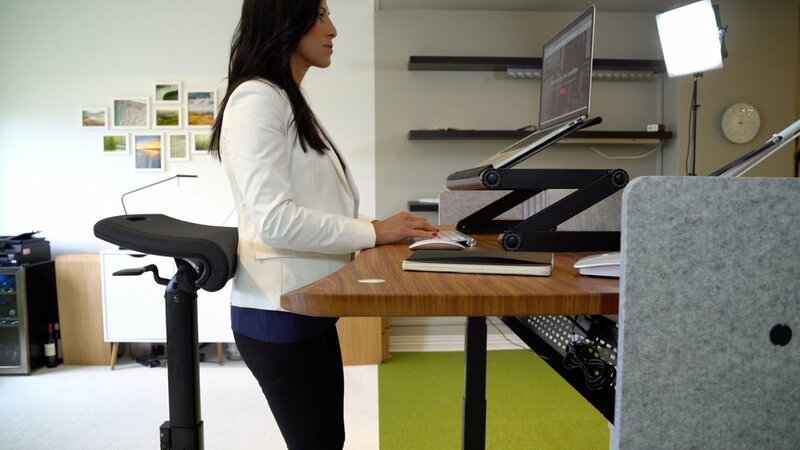 And movement is exactly what a standing desk can afford you if used with a quality chair that supports the body through postures dynamically. 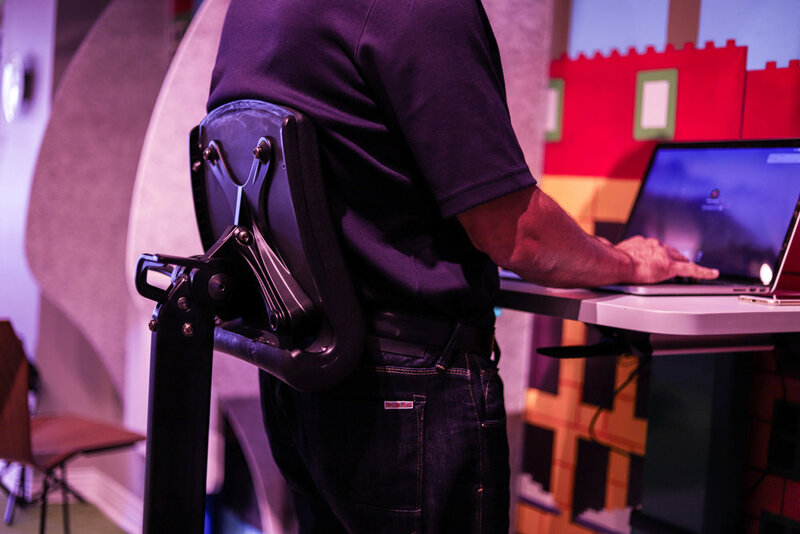 See the picture roll below which demonstrates the Lean-Rite Elite standing desk chair, for instance, adjusting to support numerous postures sit-to-stand while giving the body comfortable relief. To echo what Dr. Smith harps on, movement is what the body likes. And sit-stand workstations unlock the freedom to move. And if used with a quality chair, an anti-fatigue mat, and comfortable shoes, a standing desk makes the body feel truly comfortable, alert, and active — freeing up our minds to do our very best work. Meet the LeanRite Elite — the ergonomically designed standing desk chair that is built to encourage movement.